Newly manufactured by Fiocchi, this product is excellent for self defense with its ability to expand upon impact. Great price for hollow point ammo. 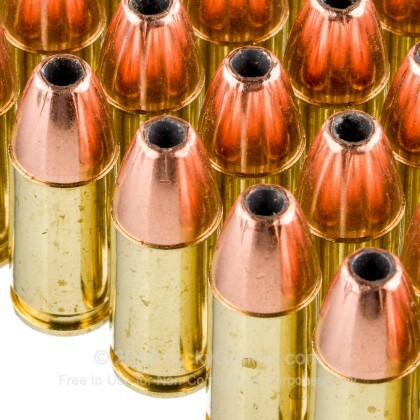 I've been experimenting with different 9mm hollow points and this is the best ammo and among the lowest priced. Great full power loads and of high quality. 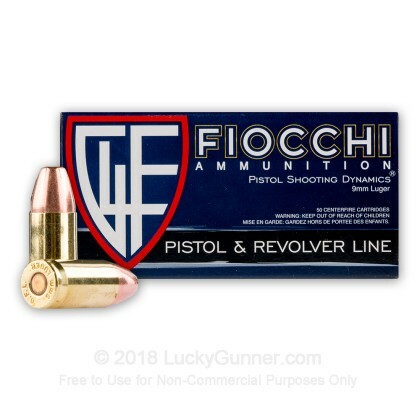 Fiocchi is one of my favorite brands. 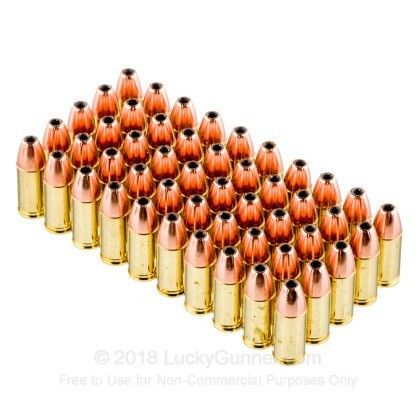 Their 357 158 gr. hollow points are great also. I use that exclusively in my GP100. Thanks Lucky Gunner. I will order again. 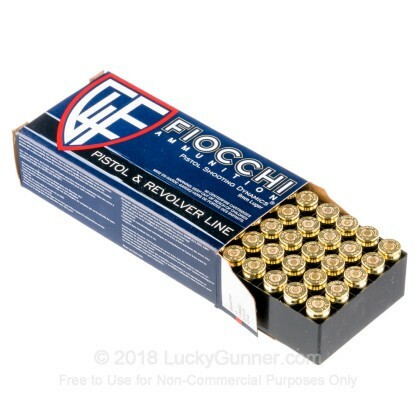 Fiocchi is my favorite 9mm ammo for my Sig P226's. I find it to be full powered, and according to the specs, more powerful than many other brands of standard 9mm ammo. I practice mostly with the Fiocchi 115 9AP FMJ rounds, and carry the 115 9APHP JHP rounds for self defense. The 115 FMJ's and 115 JHP's are very close in performance, so you can shoot more of the FMJ rounds, save 40%, and know your JHP carry rounds are going to function and hit the same. Also, I have never had a misfire with any Fiocchi rounds. I have put about 1500 of 2000 rounds down range. The rounds are accurate but lack the power to push the slide of a sig 1911 stainless match elite to the lock open position on the last round. The ammo is fine in the sig 228 and 938. 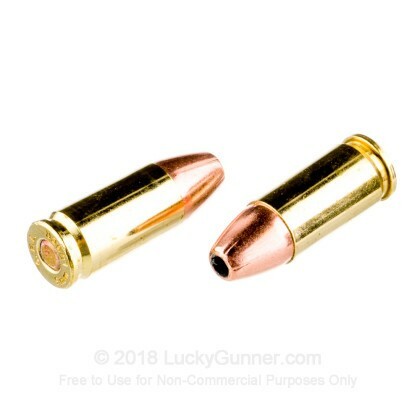 I bought these because I prefer to spend some time practicing with a round I would carry, instead of having to switch between FMJ and HP in my carry guns. I am pleased with the performance and reliability of these rounds out of our guns. The feel much like Federal HST or Hi-Shoks and perform on target much the same. If you randomly swapped these rounds with the HST 124 I would not be able to tell the difference from the shooting alone - usually I can. Feed and fire is clean and I have had no issues to date. I generally need several hundred rounds per gun before I am comfortable with carrying the load, and these all meet muster. I won't even get into the dregs of "terminal performance" and the internet ninja-ry that goes with such discussions. I'll let others make such foolish comparisons. All I can say is that these expand when they hit, just like they should. The numbers say they have the same energy as the more popular rounds, and they do all this at a better price. Sold. One difference between these and the HST rounds (which I also like) is that the jackets on these do separate when they hit steel, whereas the HST rounds generally stay bonded to the lead. The Fiocchi lead stays solid and does not fragment - the jacket is the only thing that seems to drop off, and it only does so on impact. I checked for the normal tell-tale signs of early separation and have even fired these through suppressors with no concerns. In my view: nothing. Again...not a self-claimed expert on such things, but only add this data point for those who think they are. In my view, such separation is a problem more for the receiving party than for the shooter. Other quality rounds from firms like Federal - outside the HST line - also do the same thing. FWIW, these are supersonic rounds and you will therefore hear the sonic crack even with a suppressor. The Federal HST 135 and 147s will run subsonic for those who care. But they are expensive. 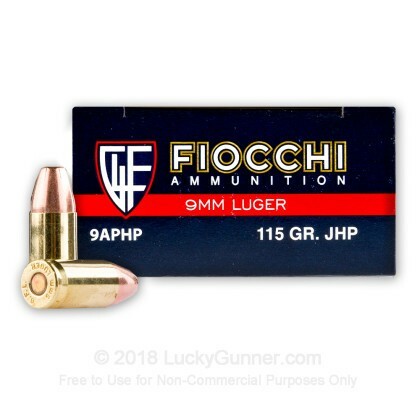 We also have this 9mm - 115 Grain JHP - Fiocchi - 50 Rounds ammo in stock in a smaller quantity.